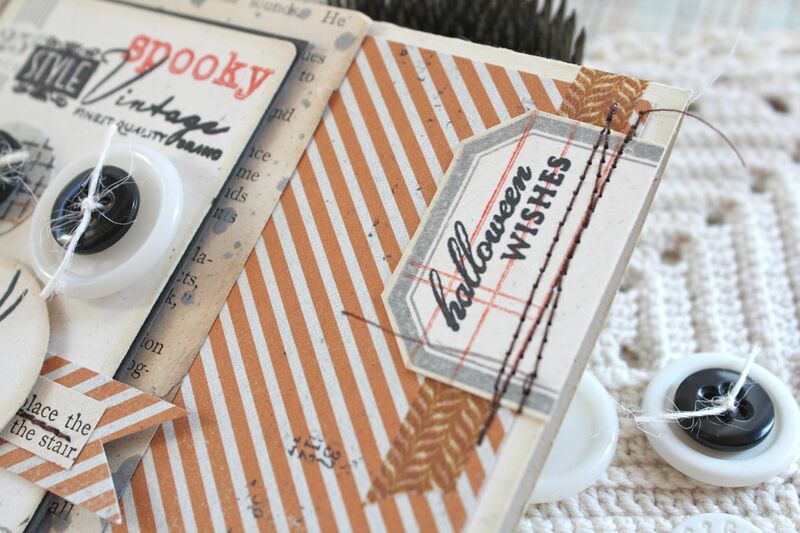 My first creation today is a Halloween card featuring an embellished button card. I used Button Boutique stamps + the button card die to create the base of my button card. 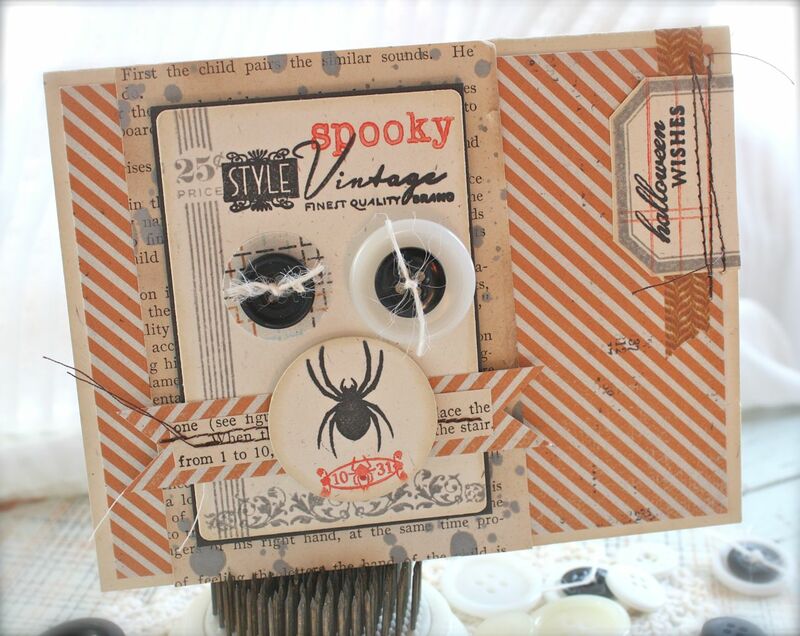 From Spooky Sweets II I used the spider, the scroll image and the 10-31 sentiment to embellish the button card. I used Smokey Shadow, True Black and Terracotta Tile inks. 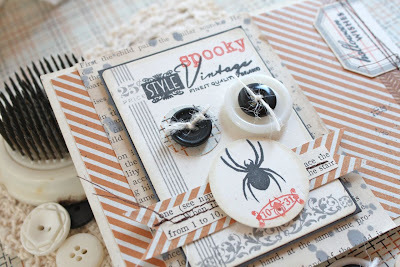 Vintage Buttons were placed about to look like layered eyeballs tied with Rustic Cream Button Twine. On the side of my card I used the halloween wishes sentiment from Spooky Sweets II along with Label Basics + coordinating die and Mini Scrapbook Series: Library Ledger for the orange ledger lines. A little snippet of Washi tape behind the label and some machine stitching attaches the embellishment securely. This will be a fun card to send out this year....definitely will be using a bubble mailer since I've got some bulky, dimensional layers here. Next up I have a fun treat item that the girls and I are going to make for a Halloween bash for their girlfriends. We are putting the finishing touches on their new Lounge room and I'm sure they'll be itching to have a party soon. 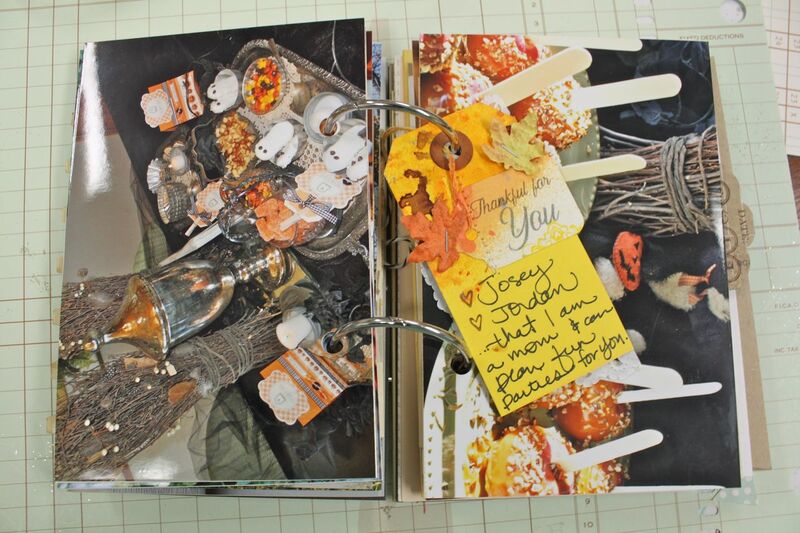 A little online inspiration + a great idea from Josey's art teacher and we have a plan. 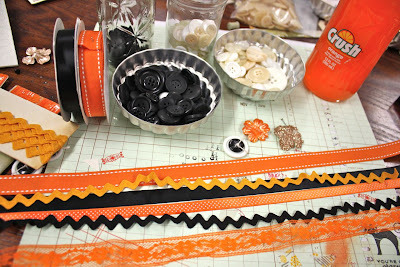 I gathered up some ribbon...some from the Papertrey Perfect Match collection and some ric rac + lace from my vintage stash. 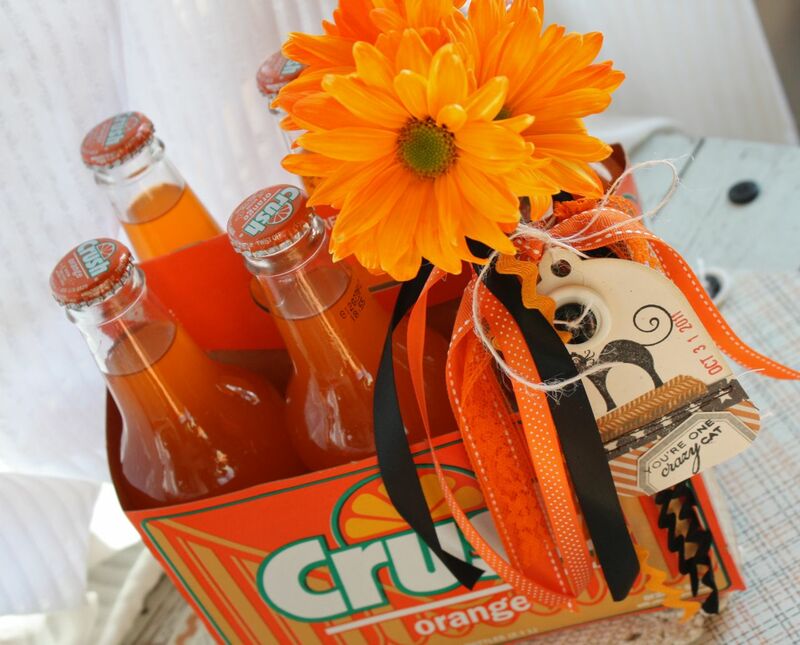 We have an ongoing tradition that each Halloween party should have orange soda. I really love the look of Jones soda bottles but couldn't find any at my local grocery store. So we went with Orange Crush bottles. Josey's art teacher has a class fundraiser each year around Valentine's Day where they sell Crush bottles with an attached note and ribbon. The note says something about *I've got a crush on you* or something of that nature and the bottles are delivered to the classrooms. Fun stuff. We adapted that look for our Halloween sweet treats. Simply wrap an office brand rubber band around the neck of the bottle twice. Tie 5-6 pieces of ribbon around the rubber band using a simple knot. Make a cute tag like I did here using the Tag Sale #2 die and tie it to the rubber band with more Rustic Cream Twine. Our school mascot is the wildcat so I thought the black cat + cute sentiment would be perfect for these crazy girls. I used a portion of a Label Basics die for the sentiment and another layered button eye. The date stamp is from my office supply stash. 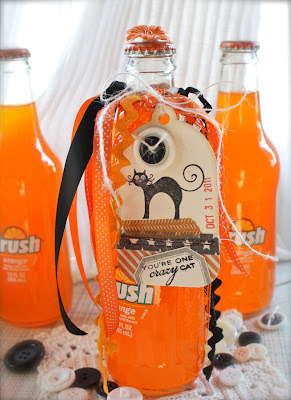 At our parties the orange soda always goes fast because it's kind of a novelty item. Just one for each party girl. But after the bottles have been emptied they're just too cute to throw away (or please recycle) so soon. 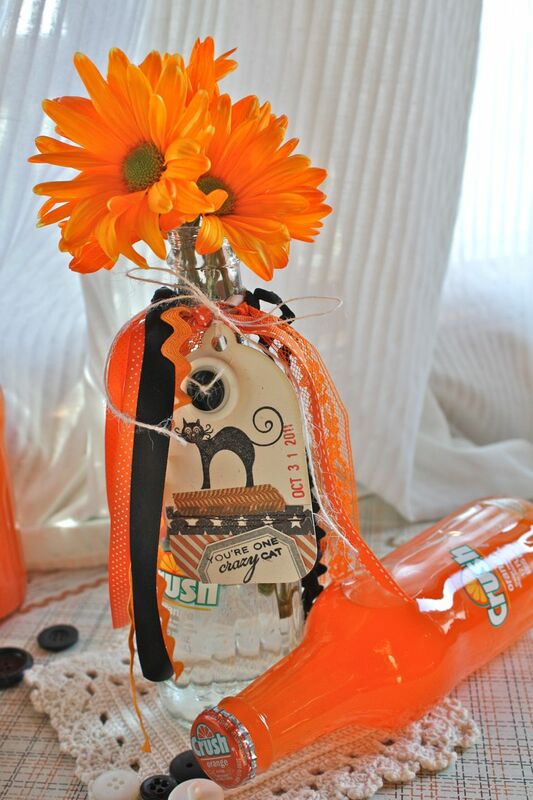 So this year I'm going to purchase some orange flowers from the grocery store (I got a huge bouquet for $5 bucks at Walmart)....rinse out the bottles and insert a few fresh flowers. These will make great little centerpieces for the rest of the party and then each party girl can take a bouquet home with them. 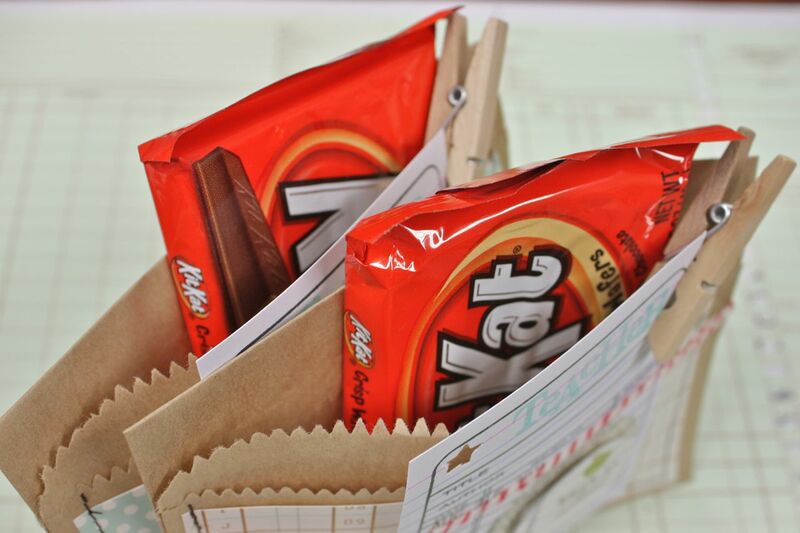 Girls love to take home little party favors. So what if you're not having a party? Maybe you're having a quiet little evening at home this Halloween....or perhaps you like to do the *You've been Boo'd* thing that sounds so fun. 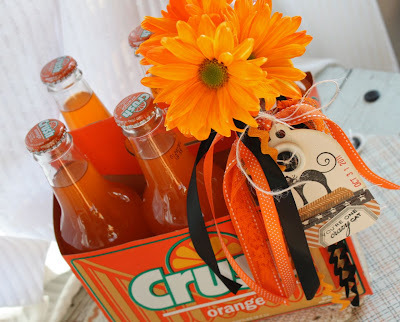 How about take the entire 6 pack....sipping one bottle for yourself...adding the ribbons and tag + flowers.....and leave it on someone's door step. Ring that door bell then run for cover. The little squirts would love this! Hi guys. I'm back today with a new featured called Mish Mish Tuesday.....okay, just kidding. 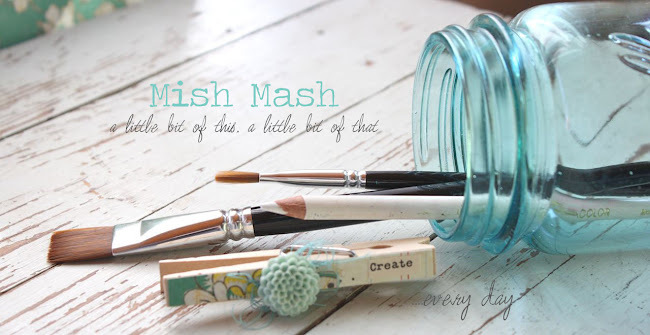 It's not a regular Tuesday feature....but I do think I'll stick with the Mish Mash Monday feature. It's a good way to post about everyday life stuff. 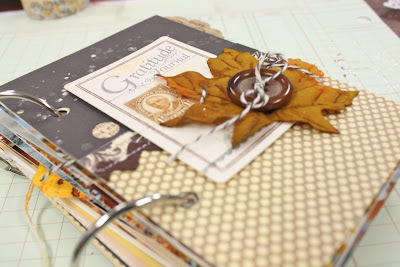 Today I am back though with an update to my Gratitude Journal. 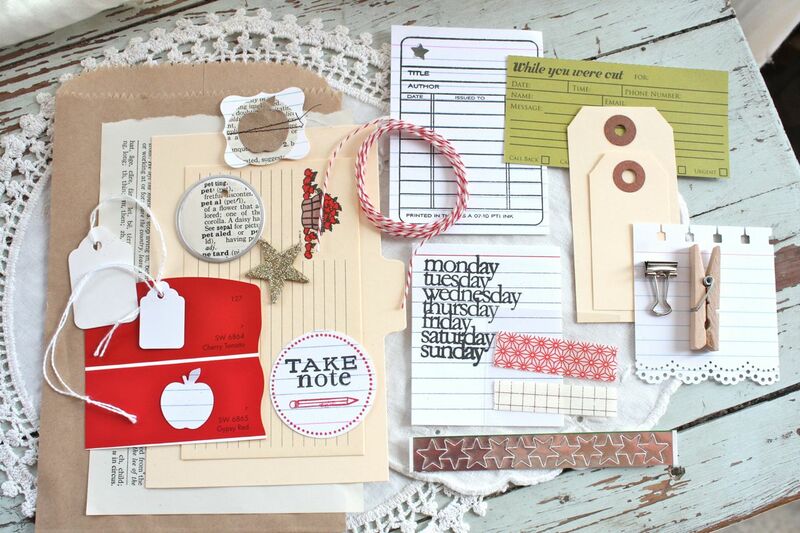 This is a great little kit that features over 80 pieces of pages and embellishments. 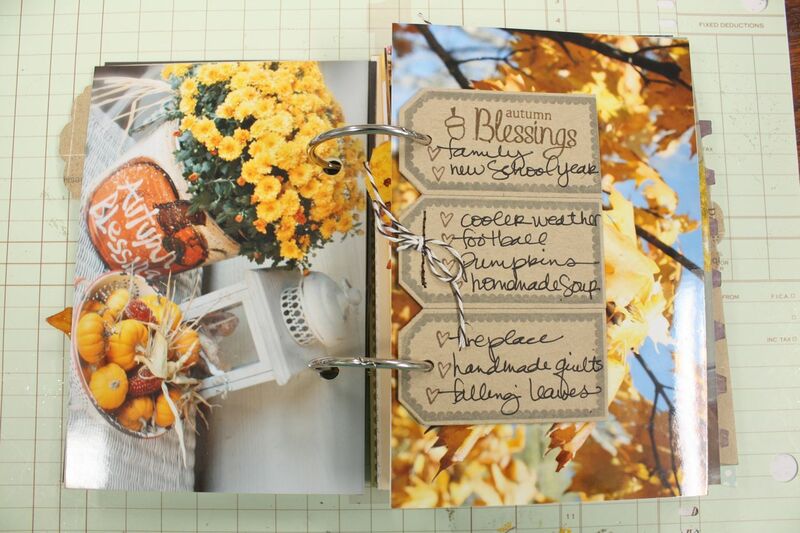 Perfect to document the changing of the seasons, Fall photos, Halloween, Thanksgiving.....or just a journal to jot down your thankful thoughts. I included a section in my journal for 2010. 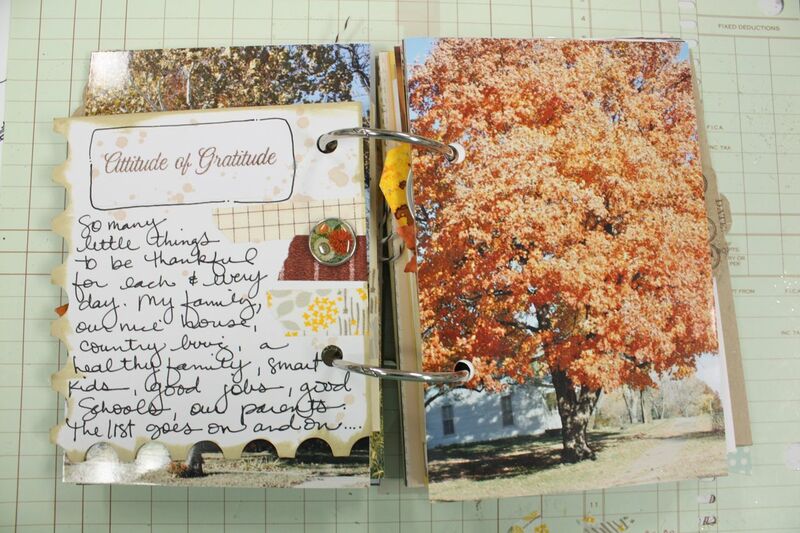 I did a little Fall photo shoot last year of some pretty trees and flowers and knew my Gratitude Journal would be the perfect landing spot for them. 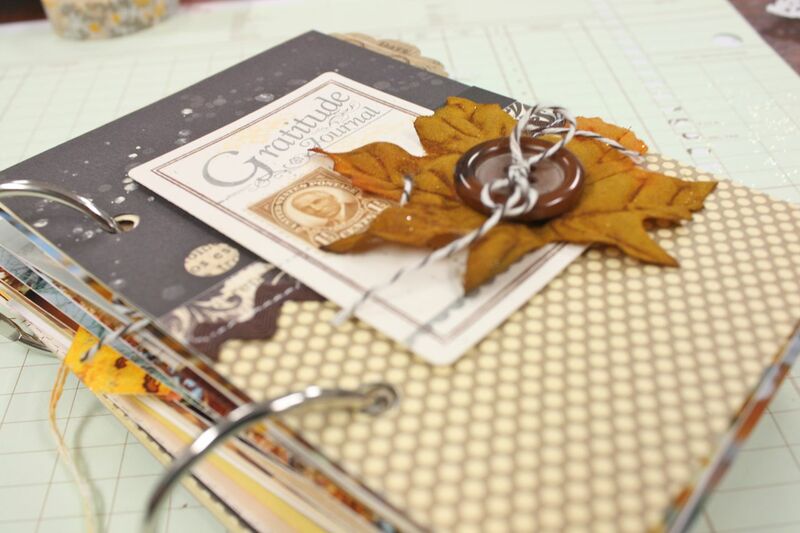 The Gratitude Journal is 4" x 6" finished size, with lots of tags and smaller items. 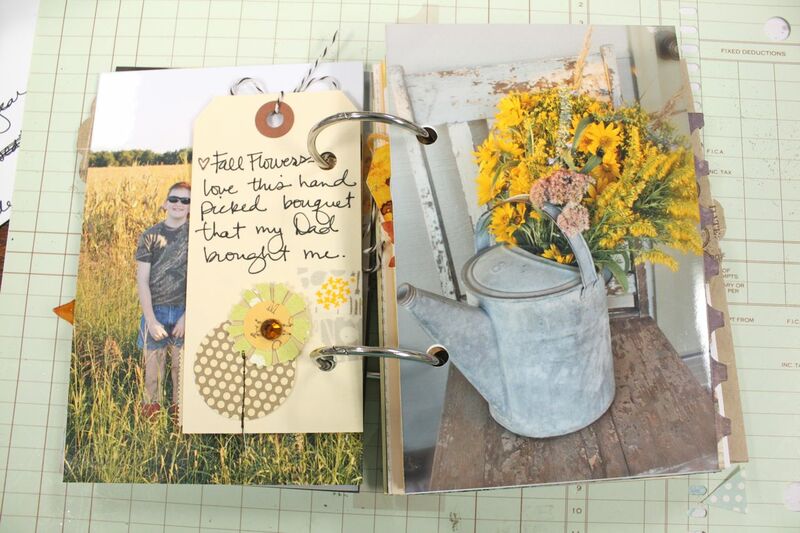 Since my photos are typically printed at 4" x 6" I used the photos to create the pages. 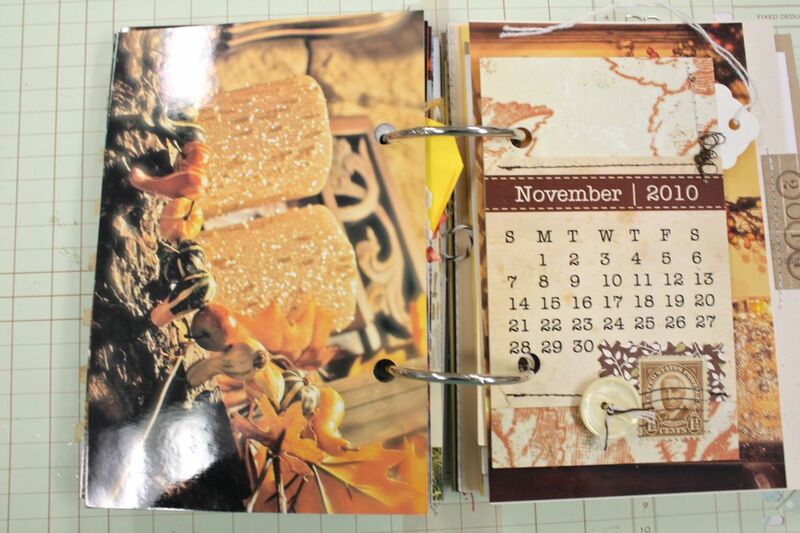 I simply adhered two pages together and then punched two holes. 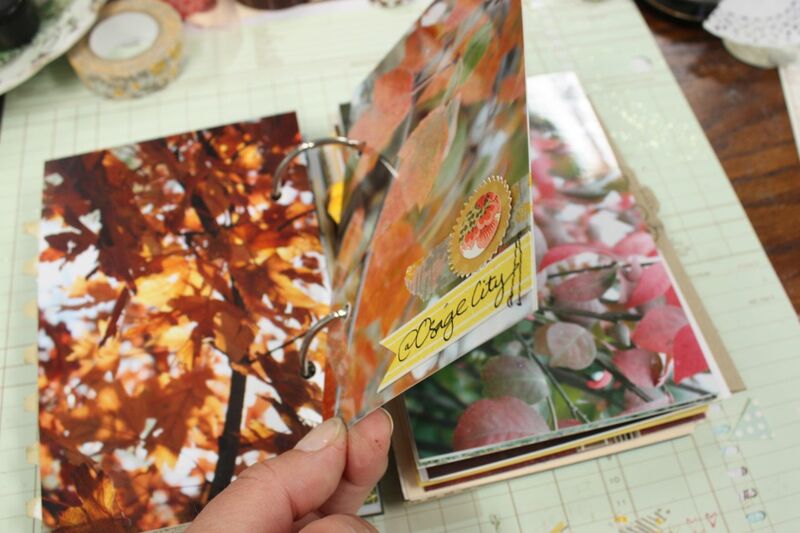 A perfect way to add some bulk to your mini album without adding a ton of embellishments. For most of my pages, I added a smaller tag or journaling piece between two photo pages. 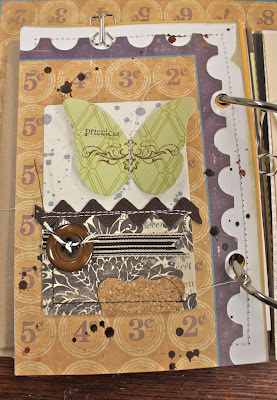 Here I used a Large Manila Parcel Tag as a journaling accent, adorned with a few butterfly accents. 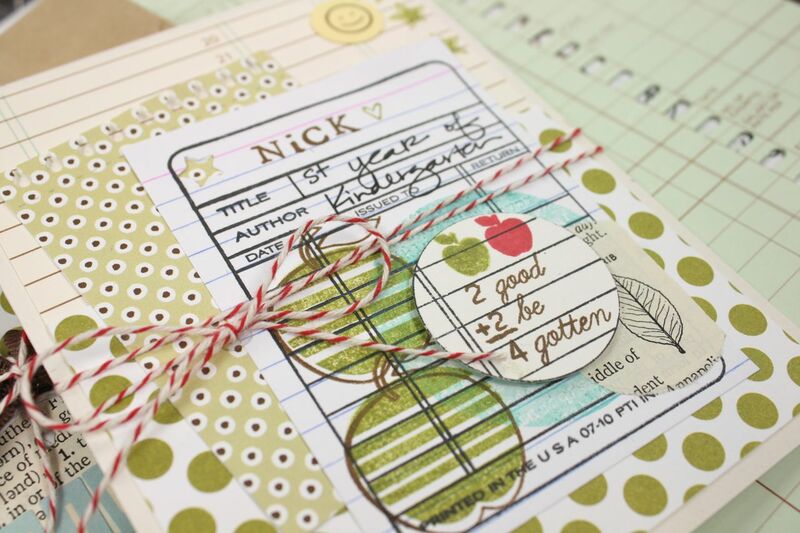 More journaling on the back side of the tag with a few embellishments from the kit + the addition of some Washi tape. Here, I made a smaller journaling page from patterned paper + a stamped button card for journaling. 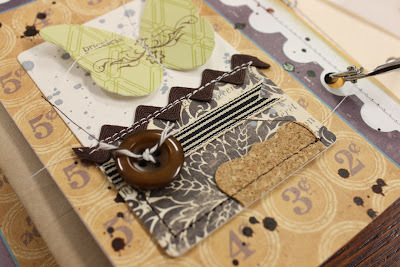 And the backside which uses a label from the kit + more Washi tape plus a brad. With this size of album + the beautiful photos, I don't think there needs to be a ton of embellishments. Just let the photos speak for themselves. Here I've used a simple White Metal Rim Tag for a little bit of journaling. So many uses for these little tags, I love them. Medium Parcel Tags like this yellow one are perfect for trying out spray mists. I added a Large White Tag by machine stitching it right to the yellow tag. 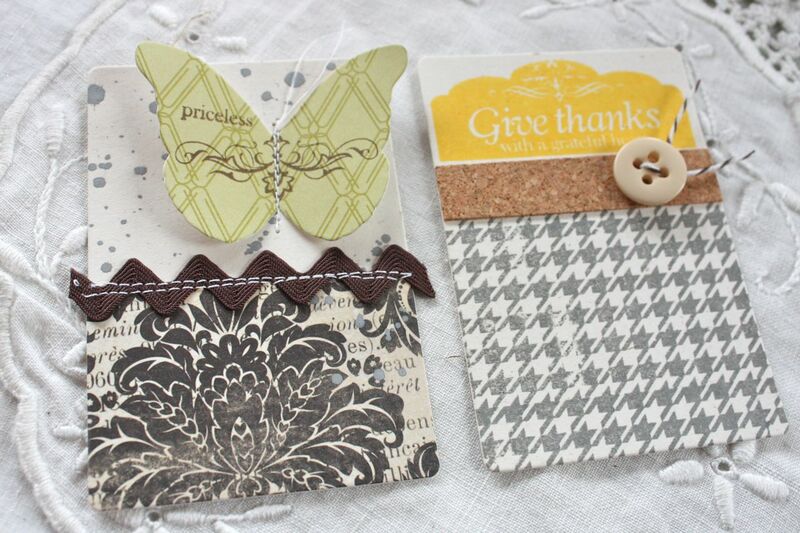 I've updated my section of tags in the shop..lots of fun options for journaling and and card accents. 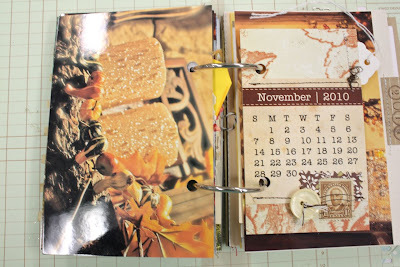 Here I've used a November 2010 calendar from Elle's Studio (I think) + the addition of a few accents at the bottom. An index card is perfect for keeping your journaling nice and straight. I stitched on another Large White Tag and added an accent from the kit. 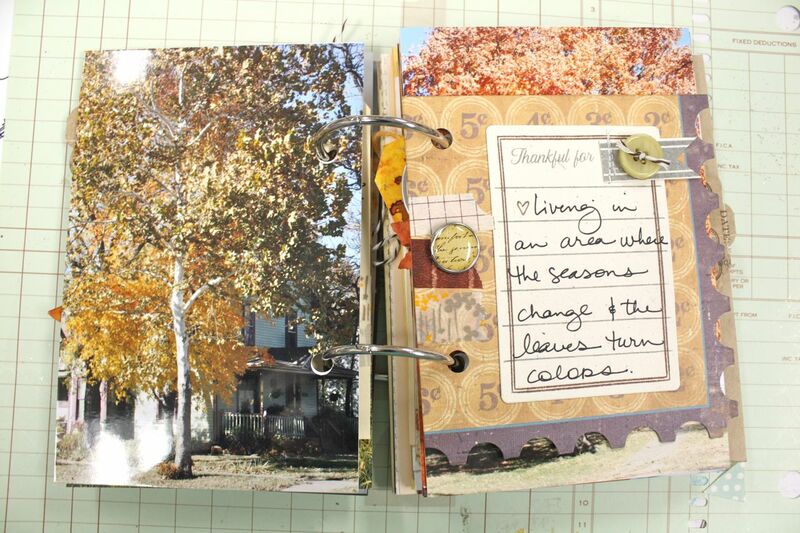 I'm going to keep my Gratitude Journal handy as I loved adding in the Fall photos. Think I'll do another Fall photo shoot this year + get some good Thanksgiving photos to add in to the 2011 section. Side note: Little journals like this make me so glad that I scrapbook. When you're right in the midst of making current pages, you don't really think about how significant a few photos might be. It's not until later on.....like me looking at the beautiful Fall trees from last year......that you really appreciate all the photos you take and the memories you are making. I think I'm going to set out a special place to house all of my mini albums. They're just so easy and fun to thumb through. Hey there. This week marks the first full week of school for the reds. As they adjust to their new schedule, I need to do the same. I have lots of catching up to do from the summer months so I want to make the best use of my time. Someone said recently, *I work on the Internet, I don't want to live there too*. So true. With all the fun computer time suckers like blogs, Twitter and Pinterest, I can easily spend a lot of hours on the on Mac and iPhone because the Internet is so easily accessible. I'm making a schedule and we'll see how it works. With all that said, there's a lot of fun stuff I like to share with you all. Not for assignments or my Etsy but simply because I like to share. I'm gonna try it out and see how Mish Mash Mondays work. Random posts on Mondays to kick off our week! A little bit of this, a little bit of that. Feel free to share links and comments on what you're up too also. 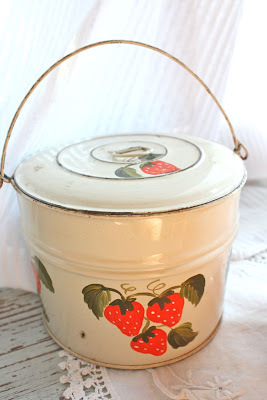 I have a thing for vintage strawberries and spied this old lunchbox tin in a local shop. If you're ever in Emporia, Kansas be sure to check out Studio 11. A cute little place with a funky, vintage vibe. The painted strawberries remind me of when my mom was heavy into tole painting. She was very good in her day. I can still remember her painting what she called Dolly Parton hearts. And the cute little jars? 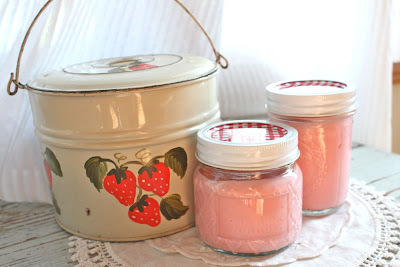 Walmart has the most darling little jars out with red, gingham lids and white rings. Perfect for jams and jellies.....or for storing individual servings of desserts. I'm not much on plastic containers. 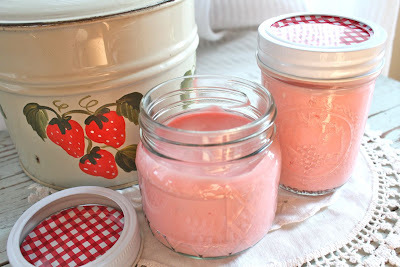 I make this Fruit Fluff that the girls just love. Dissolve jello in about 1/2 cup of boiling water. Dump in yogurt and mix. Dump in Cool Whip and fold in. Pour into jars, coffee cups, etc for individual servings. Can also pour into graham cracker pie crust for pie. Enjoy. The girls are always off to a birthday party. This has been our latest gift. A cute frame....sometimes with photo mat and sometimes not. 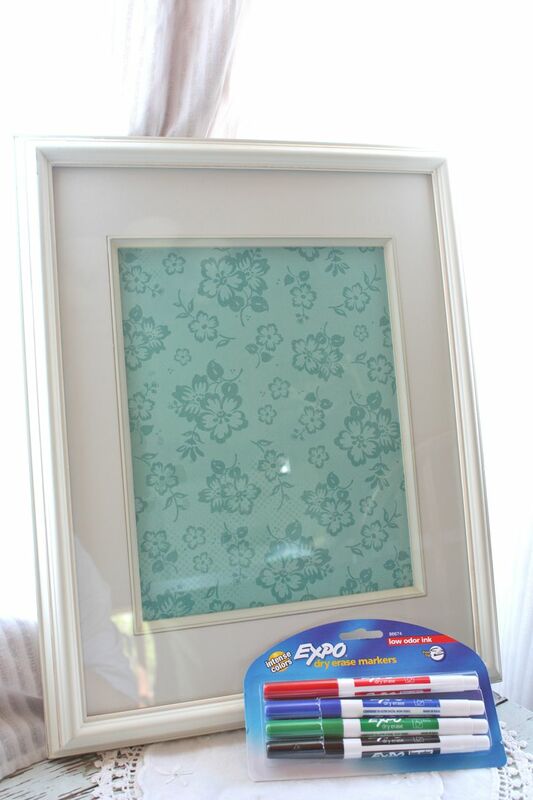 Insert patterned paper to match the birthday girl's room....pack up with new whiteboard markers. Instant message board. We keep the design pretty simple because Jordan puts these together....usually at the last minute. 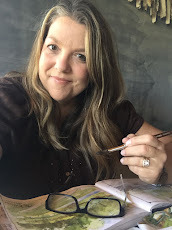 But if you want to fancy it up, check out Lisa Truesdell's quilted whiteboard. 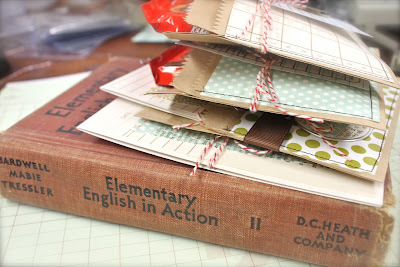 Would love to make some of these for Christmas gifts like she did. So what do you have up your sleeve for today? Work. More work? 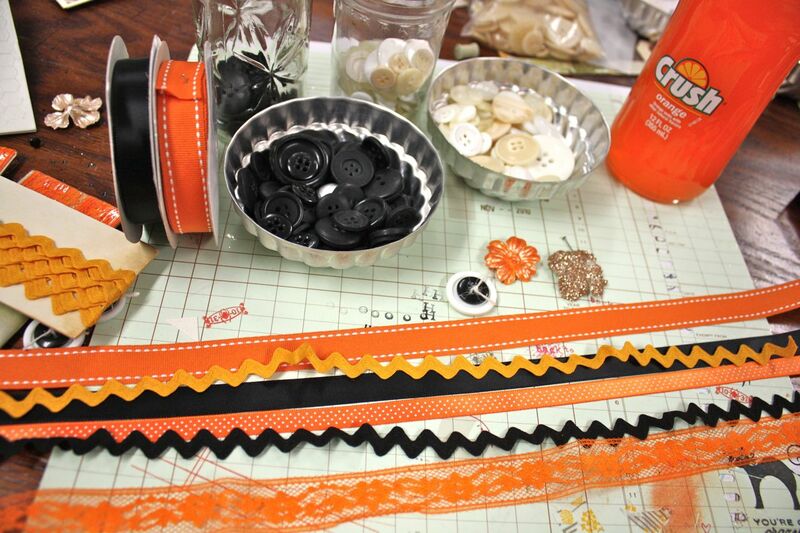 Any good crafty projects in the making? 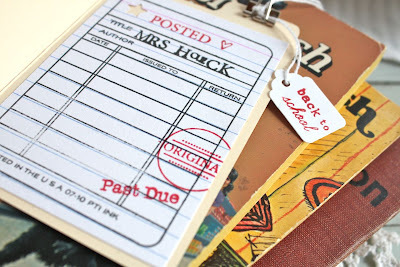 I'm headed back to the Craft Department...my new name for my craft room. I must get it cleaned up and organized. We are working on finishing up the girls' new Lounge room....and you walk right by my room to get there. And there's no door yet. Needs help. 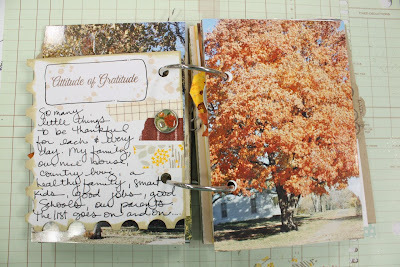 Also working on Project Life and am adding a few pages to my Gratitude Journal. Hi friends. 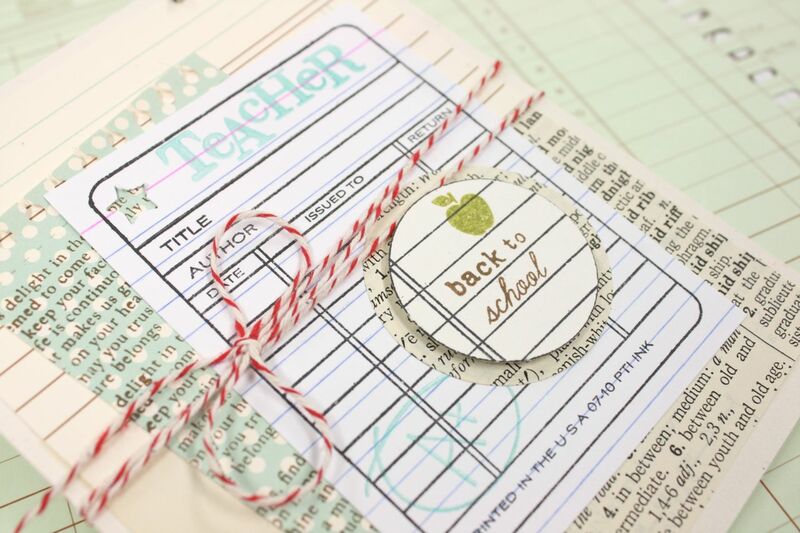 Today my sweet reds start a brand new school year. Our family has had a great summer and I'm a little sad to see it end. It will be very quiet around the house without the girls here during the day. I'm also looking forward though to hearing all the buzz about the new school year and watching the girls play some volleyball! With a new school year comes lots of changes. Josey(right) is a Freshman this year and Jordan(left) will be in 8th grade. As our girls are growing up, it's now more than ever that we really see the adults that they are becoming. It's now, as parents, that we need to help our children to be the best they can be. 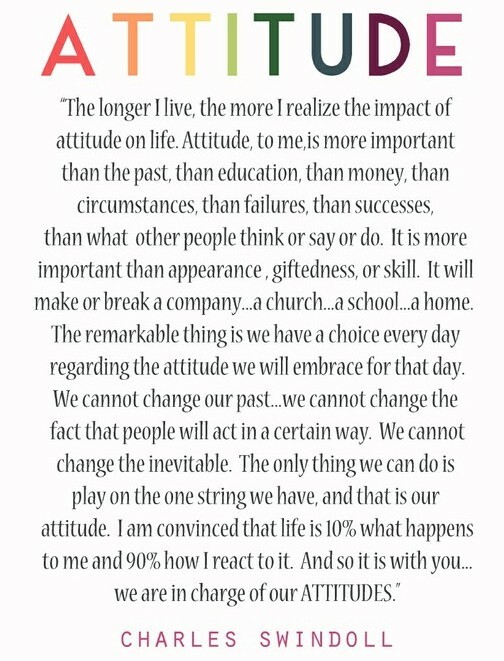 We've been having a lot of talks about the things that comes into our lives. Whether it's girl drama at school or issues that we as parents have to deal with, we are watching them and they are watching us. We are learning from each other. 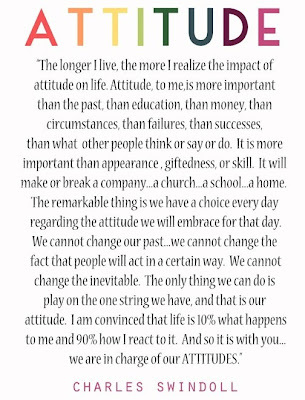 We have decided that the best approach is to begin with our own attitudes. All of us as a family. We are teaching the girls to stand on their own two feet. That what others say or how they act is not our responsibility. That we should approach each day with a positive attitude and go about our business. Be the best we can be. The rest will all fall into place. So today I'm printing off one of my favorite clips I've kept for years. I'm taping one to each of the girls' mirrors. 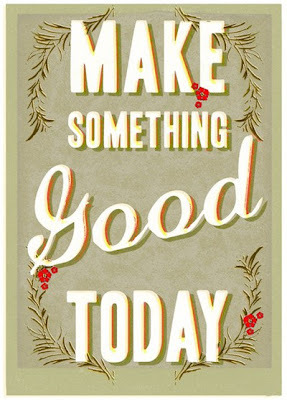 Positive reinforcement is a great thing! Here's to your best years yet, my sweet girls!! Hey there. My Internet has been down due to a huge fiber cable cut in the neighborhood. In the mean time we've been making progress on the girls' new lounge room. 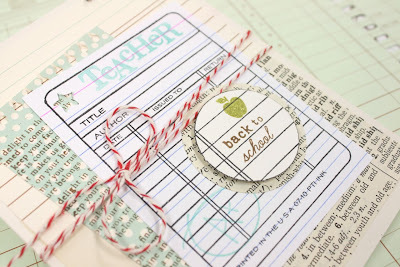 I'm back today with some another school themed project. 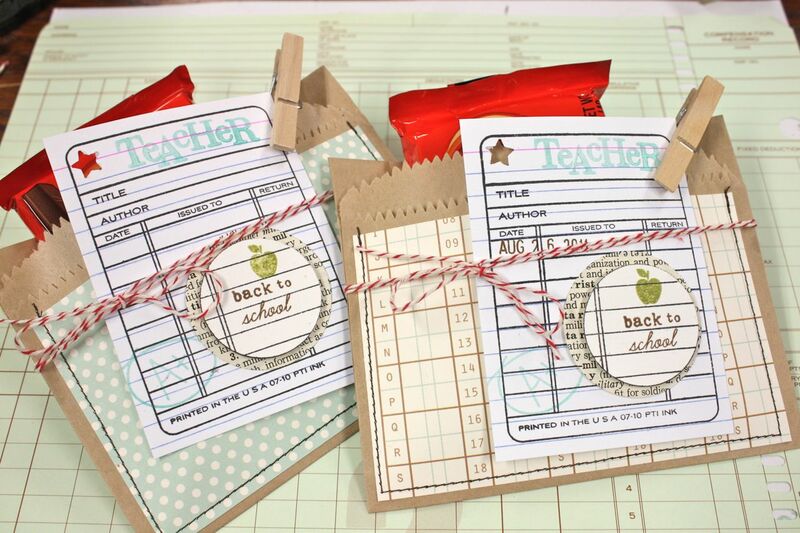 Did you purchase a Back to School Mini Kit from the shop? 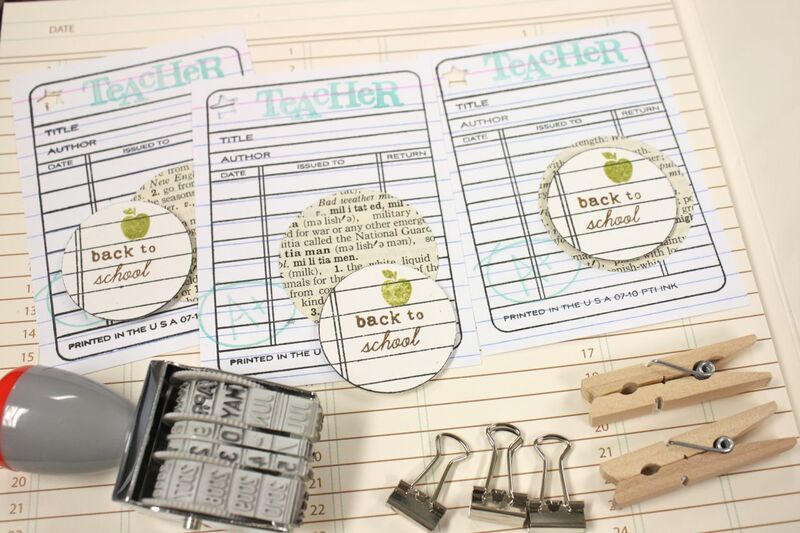 It's full of school themed items that are perfect for embellishing cards for the teachers. There's a few more left in the shop. 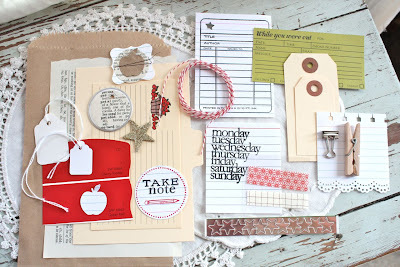 I'll be using items from the kit later on this month in my Project Life album. Great embellishments for the first week back to school for the reds. 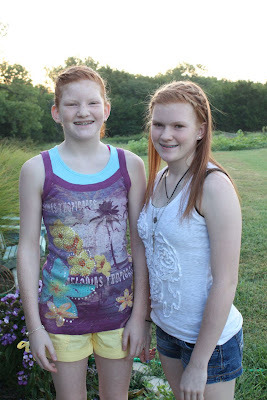 Tomorrow is Josey's Freshman orientation for half a day and then both the reds start full days on Friday. Today I have a fun sample project to show that showcases a few items from the kit. 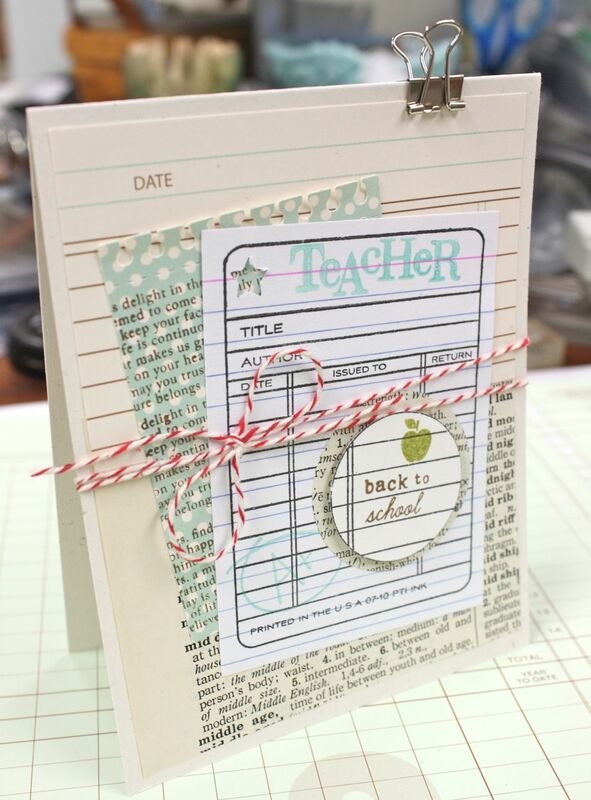 This fun card is for my friend Lori, the librarian at Josey's high school. 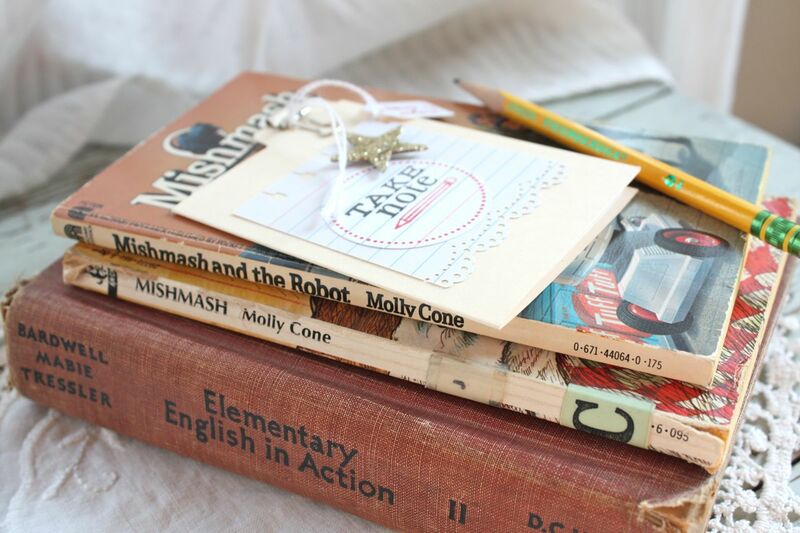 Side note: See those cute Mish Mash books? I just had to take them home with me when I spied them at a church thrift sale. Instead of using any sentiments that say *teacher*, I used more library themed accents. For the base of my card I used the large index card and folded it in half. It creates a mini file folder. Cute, right? 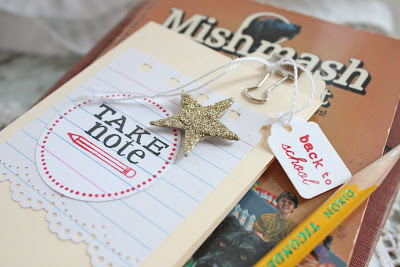 I took the mini silver clip and tied a *back to school* tag onto it. 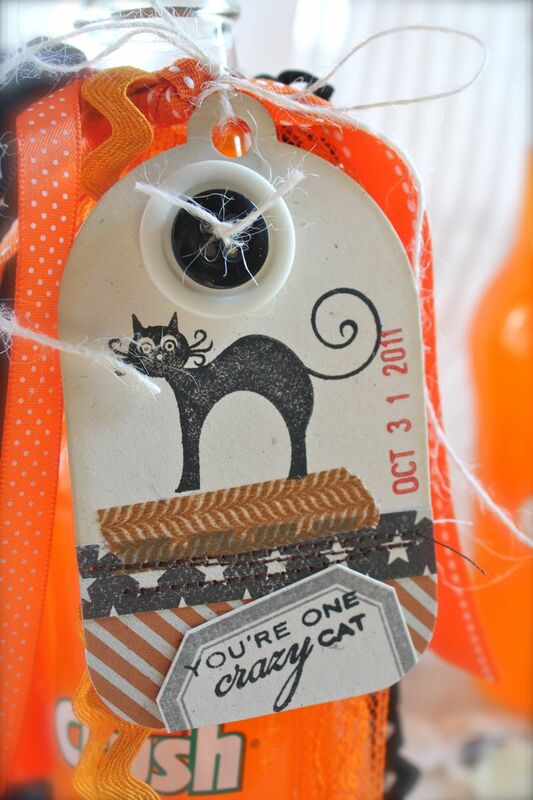 If you purchased a kit, this stamped tag will be taped to the tissue paper that wraps your kit. Be sure not to toss it out. 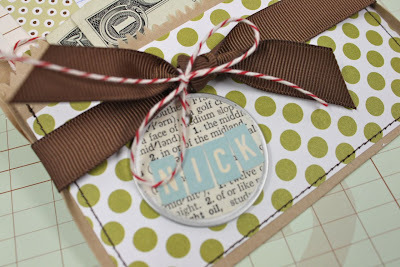 :) The little tag sentiment is from Pine's Tag-its #6 stamp set. 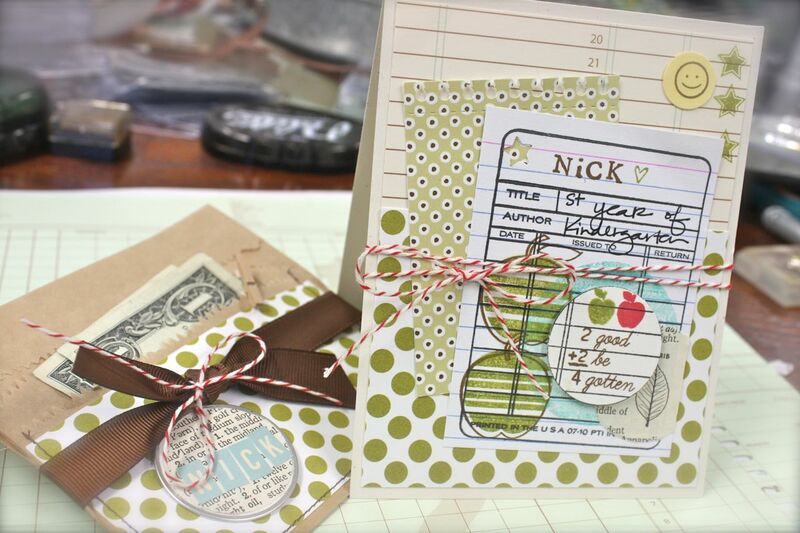 Next I used an index card accent that has been punched with a notebook paper punch and scalloped edge punch. 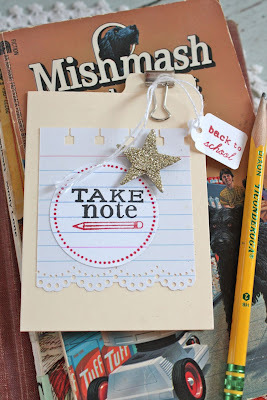 A circle accent stamped with images from Take Note was adhered on top, along with a gold glittered star from the kit. On the inside of the little file folder card I adhered the stamped library card from the kit. 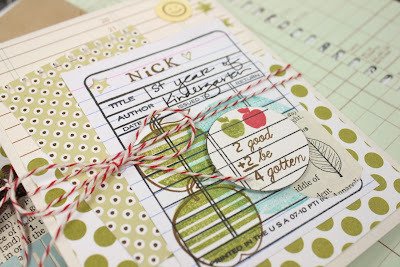 Love this stamp designed by my friend Pinecone. I also used images from It's Official to make the card look like a real library card that has been stamped and stamped. *Mrs. Houck* was stamped with my handy dandy Hero Arts mini wooden letters. Man, I *heart* those little buggers. I just love this little project. It's so fun to rummage through the little kit contents to see what you can come up with. 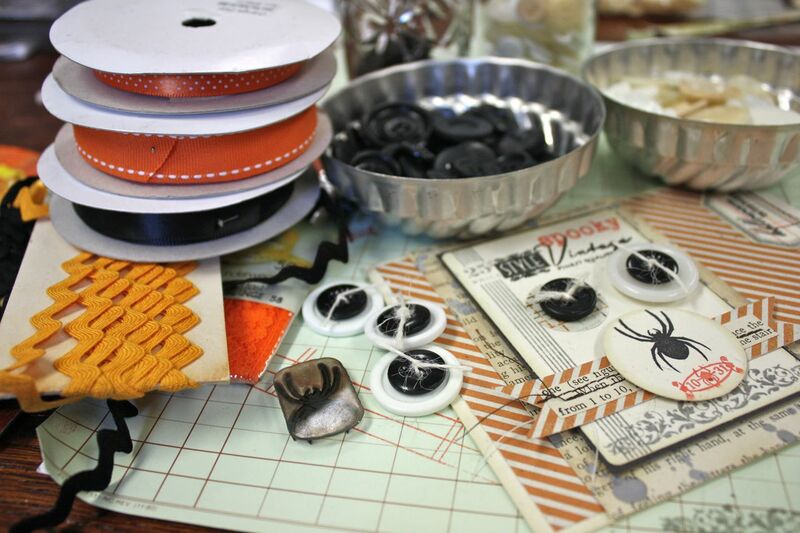 Have you created a fun project with my kits? Be sure to link me up in the comments section. Well, I'm back to The Lounge for another day of work. Today it's all about scraping 5 year old Jolly Ranchers off the floor and painting it a deep chocolate brown. Yesterday we cleared all the old toys out and painted the walls a warm mocha color. I have a feeling we are going to hang out in this room a LOT. I'm already envisioning the leather sofa, a handmade quilt, a hot cup of java and a good book. Sounds wonderful right about now. Hi again. I'm back to show you a few pages from my Fall Mini Album Starter Kit that I embellished. 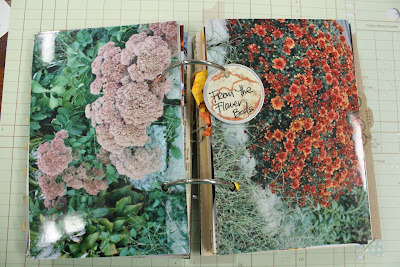 I think it's always helpful to see before and after photos of how you can embellish your pages. 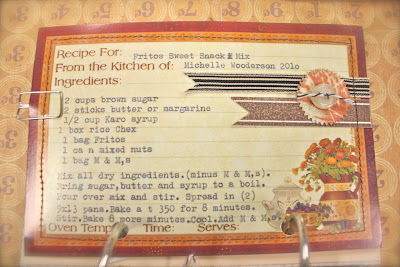 This first page that I embellished is actually the recipe card. 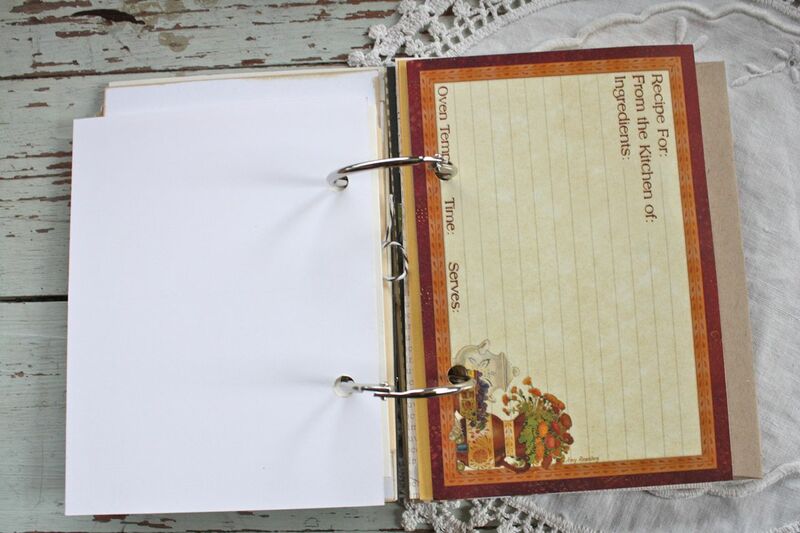 Here is the before photo of the recipe card sitting blank in my mini album. And here it is embellished + I moved the page to be adjacent to a more golden page. This is a recipe that I always fix for family gatherings. The kiddos go nuts for this sweet & salty party mix. The typing was done with my vintage typewriter. 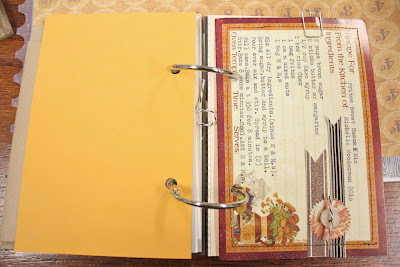 You could easily hand write the recipe or print the recipe and adhere it...or get really creative and figure out the spacing and run the actual recipe card through your printer. 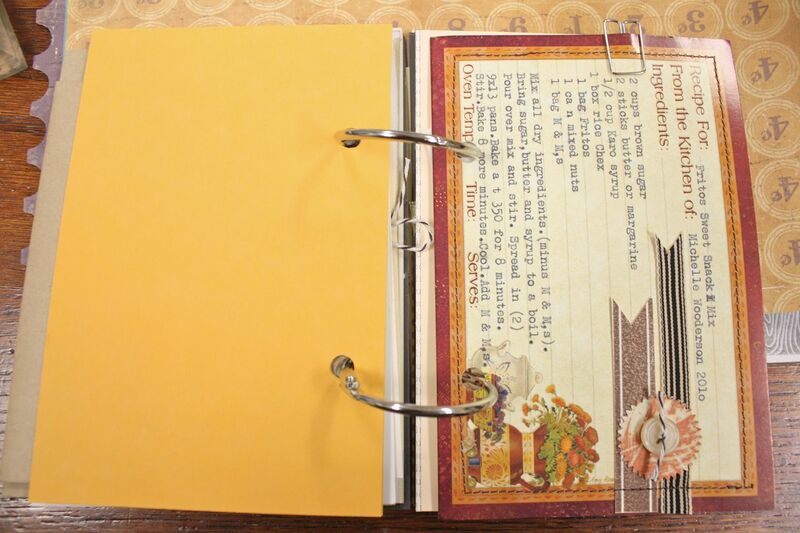 For adding details to the recipe card, I always look at the blank spaces that are leftover after the recipe is printed/typed. 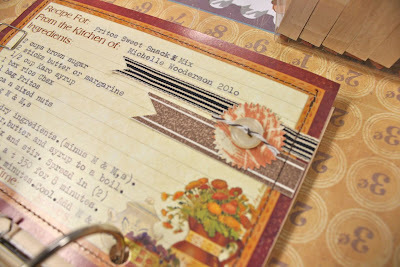 I used a ribbon + paper accent to add little notched strips to my recipe card. I then stitched around the entire card with brown thread using my sewing machine. Lastly, I used a little embellishment from a sheet that was in the kit to top off the card. Now on to my next embellished page. 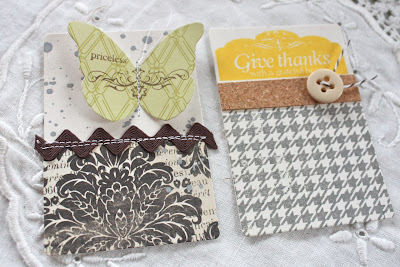 A few posts back I showed you embellishments(shown below) that I made for my mini album using the new Gratitude Journal stamp set from PTI. Today I'm going to use the butterfly button card that I created and add it to the back side of the recipe card. This is my completed page below. You can see that the stitching from the recipe card shows on this back side. I used that to my advantage instead of covering up the stitching. 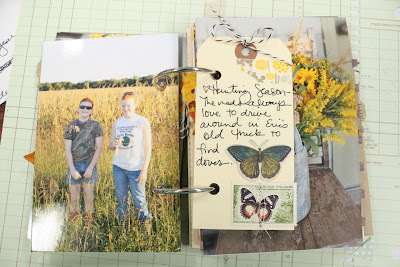 The stitching now is part of this page design. I fancied up the butterfly button card a little bit by adding more ribbon from the kit + 1/2 of a punched cork label + a tied button from the little doodad sheet from the kit. I did a little stitching around two sides of the button card and left the ends a little long when I trimmed the threads. 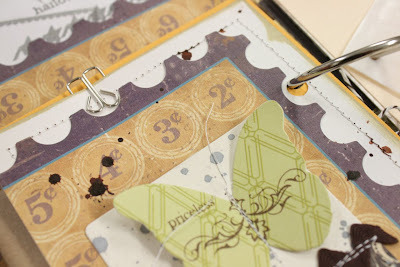 A few splatters of Studio Calico Mr. Huey ink and my embellished page was almost finished. 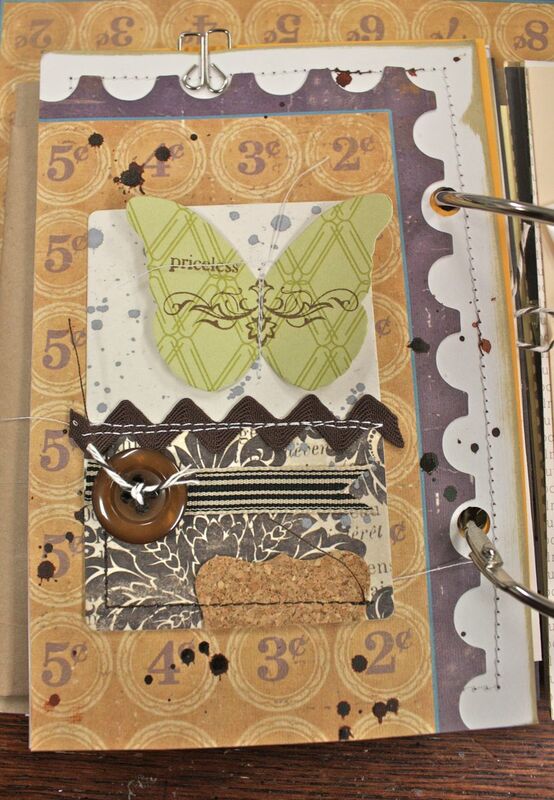 I used a little clip from the kit to accent the top of my page. It nestled just perfectly into the cut edge of my patterned paper. 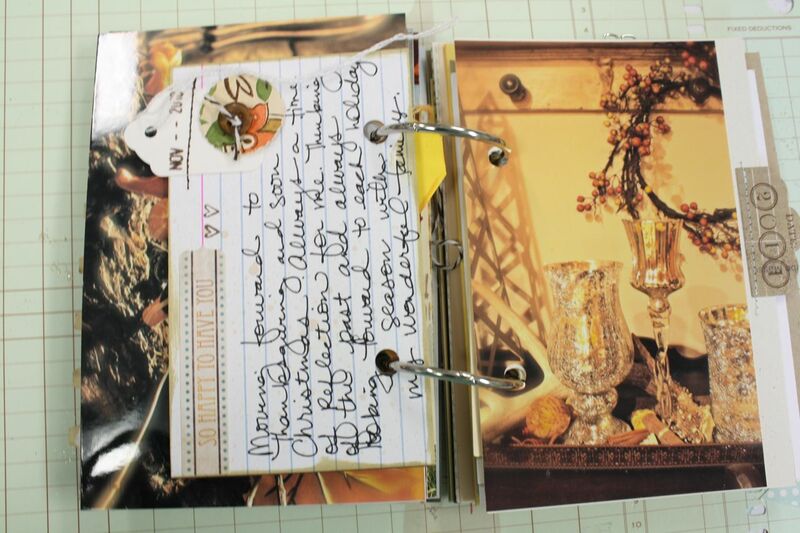 For the page adjacent to this butterfly button card page, I'm planning on adding a 4 x 6 photo from our Thanksgiving dinner this year. 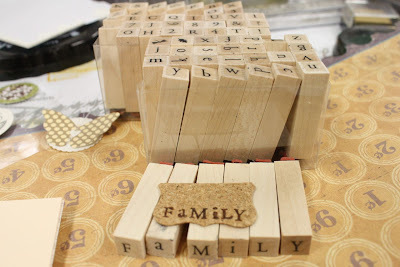 Using the other 1/2 of the punched cork label that I used on the butterfly page I stamped the word *family* using my Hero Arts mini letter sets. To mix up the look of the word, I usually stamp my consonants in all caps and my vowels in all lowercase. Oh, how I heart these little letter stamps. So here are the two pages side by side. 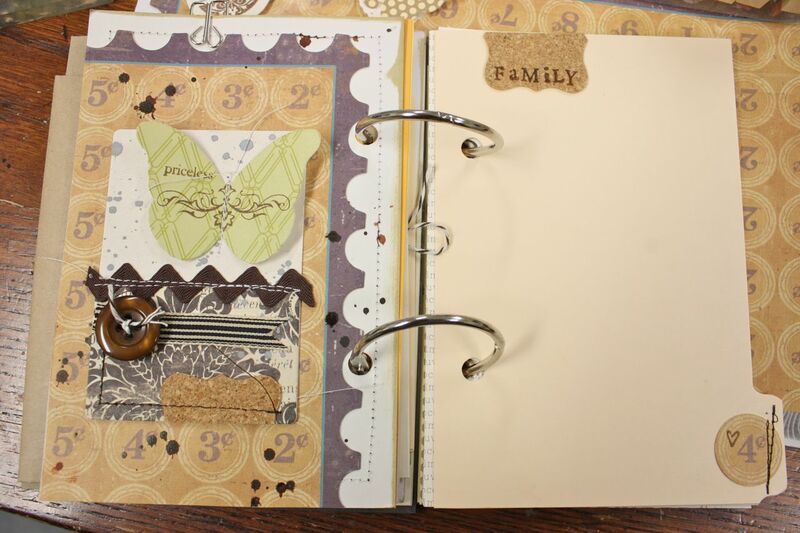 The page with our family photo is actually an index divider page that comes in the kit. The plan is for my photo to be adhered to the page that measures 4 x 6, with the exception of the little tab that will stick out. So that my photo will fit under the embellishments I'm using, I stitched the circle with the number 4 (for the # of members in my family) only on the tab part. The photo will be able to slide right under the circle embellishment. As for my stamped cork piece I will stitch that to the top of my photo (like shown above) after my photo is in place. 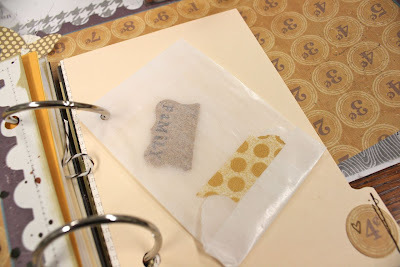 In the meantime I'm using a small glassine sack to hold my cork embellishment until needed. 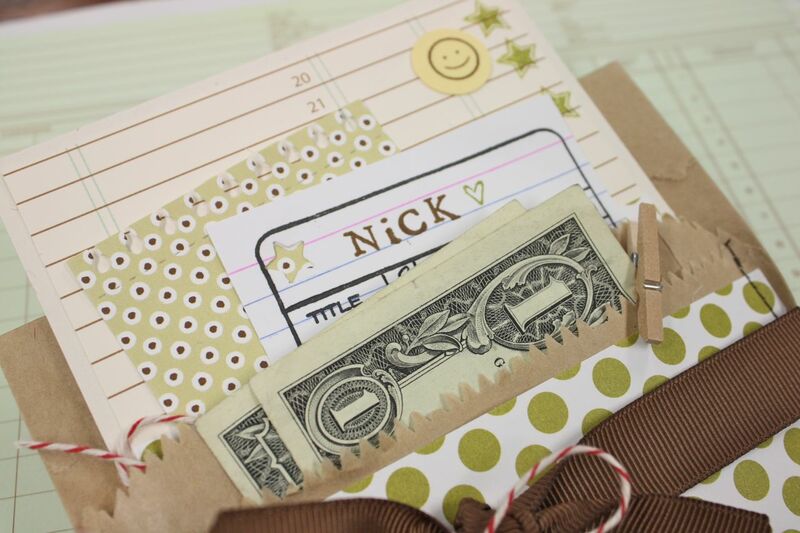 I simply punched a hole so I could add it to my mini album and then sealed the end with some cute washi tape. I hope you're inspired to create your own little mini album to celebrate the upcoming Fall season. My kit can be used for general Fall photos like leaves and trees and pumpkins...or it can become a gratitude journal...or a Thanksgiving mini book. So many possibilities. Mini albums are so much less intimidating than full blown scrapbooking. If you're new to scrapbooking but have been itching to give it a try, go for the mini albums. 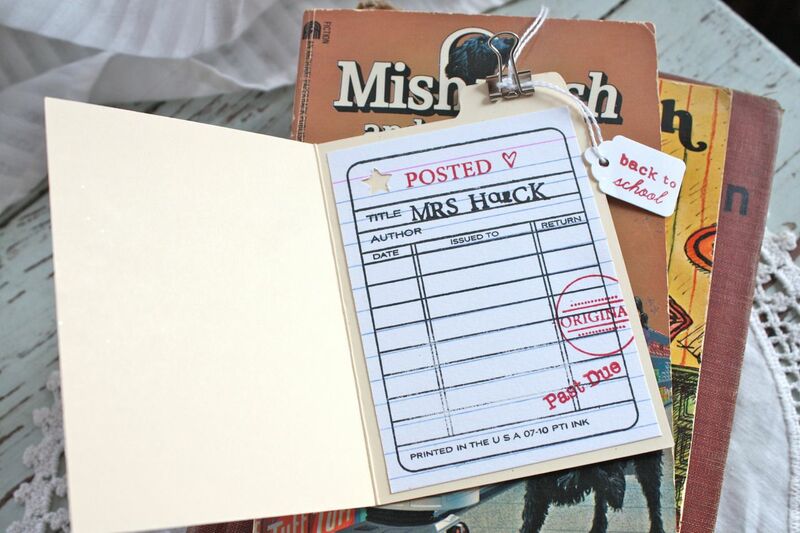 Kits are still available in the shop plus take a look around for other little tags, clips and tickets to add to your pages. Enjoy and thanks for stopping by!